In spark ignition engines, a device is required to ignite the compressed air-fuel mixture at the end of compression stroke. Ignition system fulfills this requirement. It is a part of electrical system which carries the electric current at required voltage to the spark plug which generates spark at correct time. It consists of a battery, switch, distributor ignition coil, spark plugs and necessary wiring. A compression ignition engine, i.e. a diesel engine does not require any ignition system. Because, self ignition of fuel air mixture takes place when diesel is injected in the compressed air at high temperature at the end of compression stroke. There are three types of ignition systems which are used in petrol engines. (a) Battery ignition system or coil ignition system. In battery ignition system, the current in the primary winding is supplied by a battery whereas it is supplied by a magneto in magneto ignition system. Battery ignition system is used in cars and light truck. Magneto ignition system is used in some scooters. Both the systems work on the principle of mutual electromagnetic induction. Electronic ignition systems use solid state devices such as transistors and capacitors. This system consists of a magneto in place of a battery. So, the magneto produces and supplies current in primary winding. Rest of the system is same as that in battery ignition system. 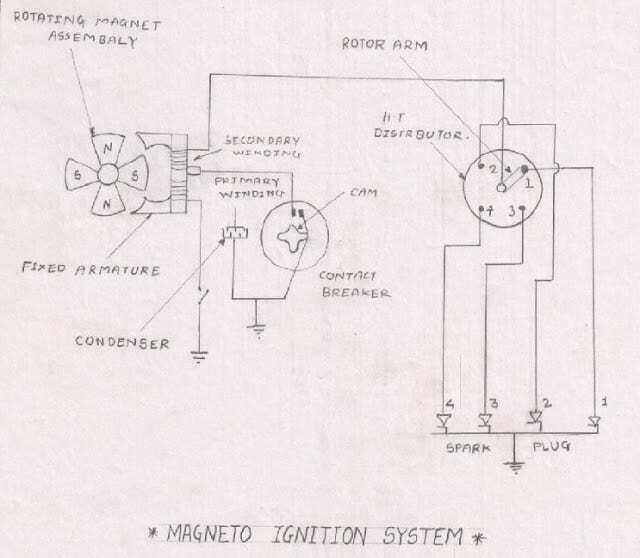 A magneto ignition system for a four cylinder SI engine has been shown in Figure . The magneto consists of a fixed armature having primary and secondary winding and a rotating magnetic assembly. This rotating assembly is driven by the engine. Rotation of magneto generates current in primary winding having small number of turns. Secondary winding having large number of turns generates high voltage current which is supplied to distributor. The distributor sends this current to respective spark plugs. The magneto may be of rotating armature type or rotating magnet type. In rotating armature type magneto, the armature having primary and secondary windings and the condenser rotates between the poles of a stationary horse shoe magnet. In magneto, the magnetic field is produced by permanent magnets. (a) Better reliability due to absence of battery and low maintenance. (b) Better suited for medium and high speed engines. (c) Modern magneto systems are more compact, therefore require less space. (a) Adjustment of spark timings adversely affects the voltage. (b) Burning of electrodes is possible at high engine speeds due to high voltage. (c) Cost is more than that of magneto ignition systems.